Alfred Marshall wrote in his Principles of Economics that “economic conditions are constantly changing, and each generation looks at its own problems in its own way” (1920, p. v.). Our generation is confronted with many problems including climate change, environmental damage, disruptive innovations, inequality, indebtedness, youth unemployment, besides a health care crisis. At the center of these problems, however, is the discipline of economics itself and economics education. 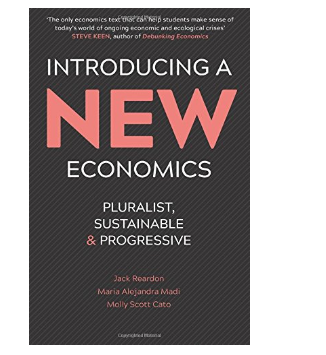 Since the French students’ petition in 2001, several books have been written on how to teach pluralist economics, including John Groenewegen’s Teaching Pluralism in Economics (2007); Edward Fullbrook’s Pluralist Economics (2009); Jack Reardon’s Handbook of Pluralist Economics Education (2009), and the WEA Conference book The economics curriculum: towards a radical reformulation (2014), among other relevant contributions. To spread the discussion on how to implement pluralism in the classroom, the International Journal of Pluralism and Economics Education and the WEA Pedagogy Blog have been launched. And several global organizations- the Association of Heterodox Economics and the International Confederation of Associations for Pluralism in Economics, for example, have emphasized the need for pluralism. Considering this background, the publication of Introducing a New Economics: Pluralist, Sustainable & Progressive (Pluto Press, 2017) is welcome. The authors – Jack Reardon, Maria Alejandra Madi and Molly S. Catto – demand that the real world should be brought back into the classroom in order to most effectively confront current crises. Indeed, with a firm commitment to theoretical, methodological, and disciplinary pluralism, the authors challenge the institutional education hegemony head on. They believe that economics must play a central role in not only conceptualizing the problems of our generation but also in articulating solutions. One, economics must comport with sustainability. As they explain in the text, many definitions of sustainability exist, nevertheless, a central element uniting the disparate definitions is an ethical concern for the future. Second, economics must become pluralist, which along with sustainability is another multi-faceted and complex word. Pluralism -understood as respect for different and opposing views- is necessary since there are myriad ways of conceptualizing problems and no one view has a monopoly of understanding. Third, economics must concern itself with justice. Our future is uncertain which requires an economics education that is open-minded and help students to conceptualize and design a more equitable economic system that can provision for all. 1) SOSTENIBILIDAD: preocupación ética por el futuro. 2) PLURALISMO: ya que hay innumerables formas de conceptualizar los problemas y ningún punto de vista tiene el monopolio de la comprensión. 3) JUSTICIA: ayudar a los estudiantes a conceptualizar y diseñar un sistema económico más equitativo que pueda aprovisionar para todos. Gracias Ernesto por la precisión y el incentivo ! This Is very relevant and complements the work done by Steve Keen. The challenge will be to have it recognized and implemented by the various vested interests in academia and the financial world. So many well-meaning economists have rightly criticized the ways past macroeconomics theories have failed to be applicable in good forecasting. This includes the new book advertised above.. But the only trouble with its (and many of the others) is that the authors fail to proceed to the next stage of providing something better, which avoids the past errors! This is where my approach differs. After a short chapter on criticism my new book “Consequential Macroeconomics” replaces the old and dismal pseudo-science of macroeconomics with a new way for its logical modeling and then it develops a suitable analytic process for examining the effects of any change in policy to an initially (assumed) stable system. Our situation in knowledge about how the system works has thus taken a better and clearer revision and now can be logically applied to the determining of the effects of new policies or of suddenly introduced external changes. Write to me at chesterdh@hotmail.com for a 310 page e-copy and clear away the effects of all those past inadequate assumptions with a far better way for understanding how our social system really works.